We also have our Special Birthdays challenge still running for another week right here so still time to play in that too! 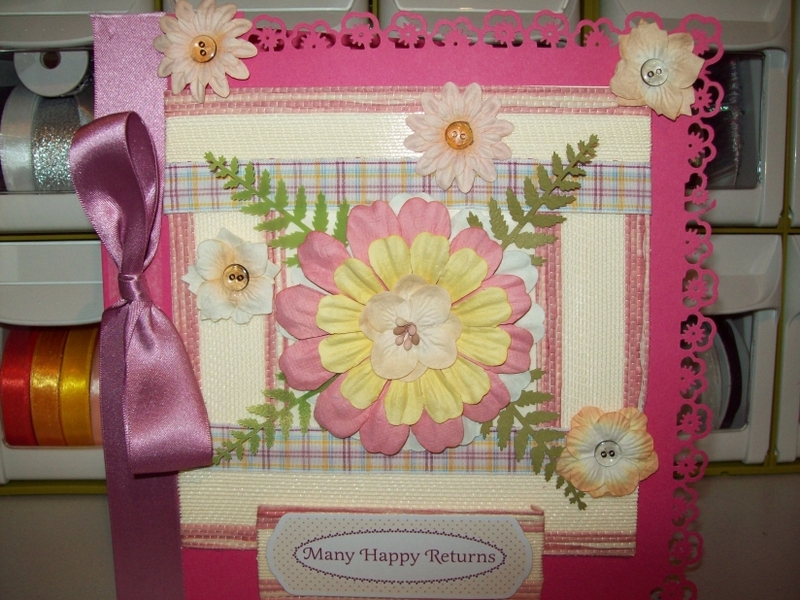 Good Afternoon and welcome back to another challenge from Crafty Cardmakers! Firstly thank you so much for your fabulous entries to our Fabric challenge, winners coming up in 2 weeks. The Winners post is updated with all the latest winners and a couple of redraws so click the tab at the top to check! We'd also like to point out that as we're shuffling things around and have moved the Spotlight Challenges over to their new home HERE we're also tinkering with the roolz so please take time to read them in the tab at the top or click here. The main change is that we are now restricting how many challenges you can combine your entry with to 10 including us. We've felt it necessary as people enter more and more challenges which is fair enough but we are about trying new things, challenging yourself and showing newer crafters different ways of doing things and some of the entries that have entered 40+ challenges barely scrape through the criteria which is not really challenging yourself (although entering 40+ challenges is a challenge in itself!) So I hope you understand that this team WANT you to roll your sleeves up and sink your teeth into something different! We have some FABULOUS challenges and spotlights coming up, some many of the DT ran screaming from and quivered in the corner before pulling on our big girl pants and declaring we can DO this! Speakng of which don't forget the Spotlight challenge is still running for another week on its new home and that is to make your own designer papers, YES you CAN do it! I'll stop rambling now and introduce you to our new challenge set by teamie MELLY who wants to see SPECIAL BIRTHDAYS! Don't forget to read the new roolz in the page at the top! We're sponsored once again by the fabulous Joanna Sheen who is offering a £10 prize for her superb online store! Thank You once again Joanna! So over to the team, have fun with this one and special gold star if I see a 100th Birthday card! As my big Brother turns 30 this month I knew a "Special Birthday" was just the ticket! With him being in the Navy I didn't want to make anything that would be too big or get ruined! Also I know he has no where to keep wee bits so simple card was perfect! I used some of my new K&Co Hopscotch papers I picked up at the SECC, my wee TGF My Guy Ian stamp coloured with promarkers! 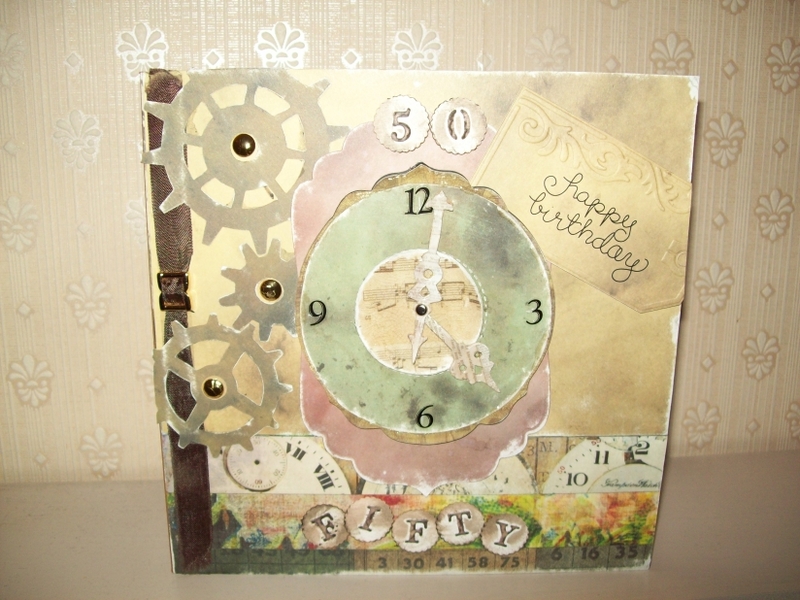 Added some nestie layers, a "30", gems and lots of glitter plus my wee stickie letters to finish the card. 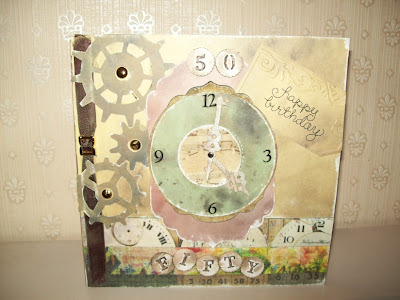 For my "Special Birthday" card I have made a 30th Birthday card for my best friend. 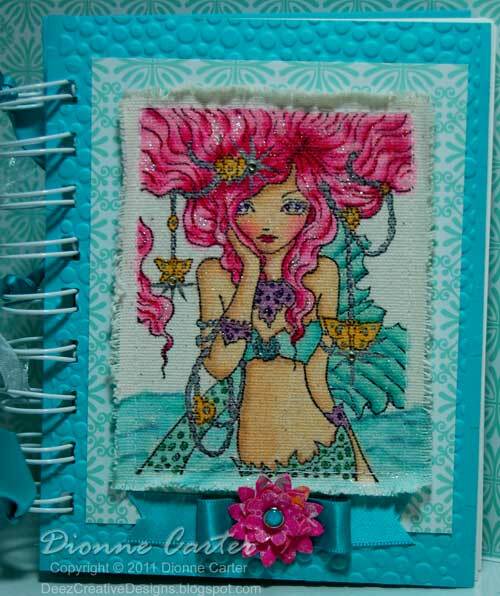 For the image I have used a Sweet Pea stamp (not sure what it's called) coloured with ProMarkers and then I have inked the background with a sponge and some ink from a "Big n Juicy" ink pad.I have also added stickles to the water. The papers are from the Henbury Lane collection, flowers are from Wild Rose Studio and little butterfly is from my stash.The border is made with an X-Cut punch. Finally the sentiment is just printed from my pc. I've made this special birthday card for a friends daughter. Oh! to be sixteen again LOL! I used: Sugar Nellie Hippie Chick and coloured her with Promarkers, Derwent pencils & Sansador. Spellbinders ovals & Scalloped ovals. Trimcraft Dessert Blooms papers, Martha Stewart & Nellie Snellen punches. Sizzix, flowers, branches & leaves set. 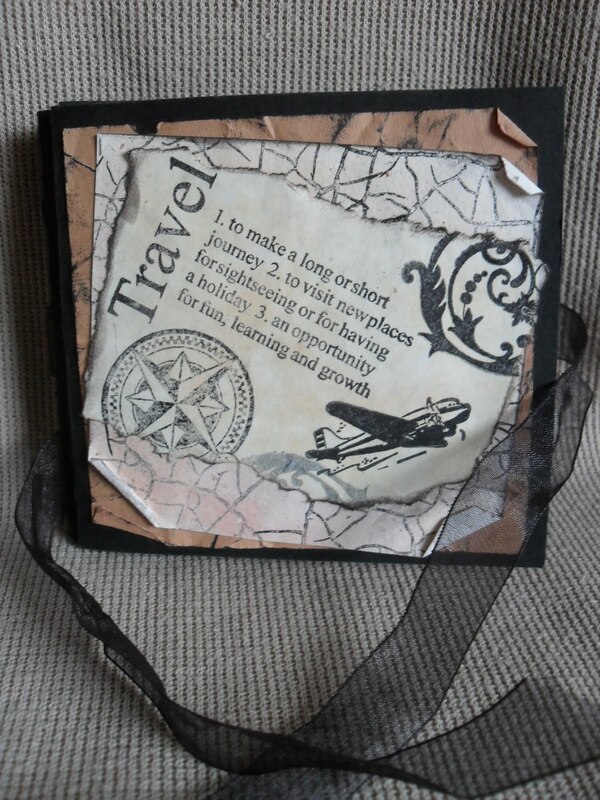 The letters for the sentiment are from a Cosmo Cricket scrapbook kit. And I just couldn't resist adding some gems. For this card I've used Cosmo Cricket 'Upcycle' papers from a 6x6 pad, the numbers are chipboard by Thickers,the letters are stickers by October Afternoon and finally I added 3 flat backed pearls and a little glittered flower by K&Co. For my card I've used a DL sized card and pinched a bit of my William Morris wallpaper for the background paper. I used a Glitter Girls panel to emboss the pearlescent green card and the blue/grey card and 'fudged' the gold mirri beneath. I then positioned the Prima blooms onto a measure of Pinflair glue gel along with the rose leaves. Before I give it to her I will make a matching box for it as an envelope won't do for this 'special' lady! 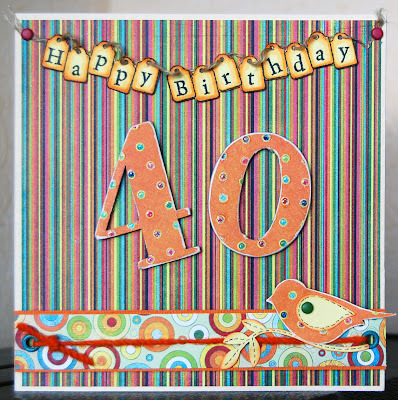 Papers are Basic Grey Lime Rickey, I used chipboard numbers and covered them with one of the papers, sanding the edges to define them, I also added glossy accents and a touch of extra fine glitter to the spots to make them stand out a bit - the punched bird got the same treatment. The Happy Birthday banner was stamped then coloured with Promarkers and cut out, I made the little holes with a sharp pointy tool (don't know what it's called!) and added some linen thread to string it all together. 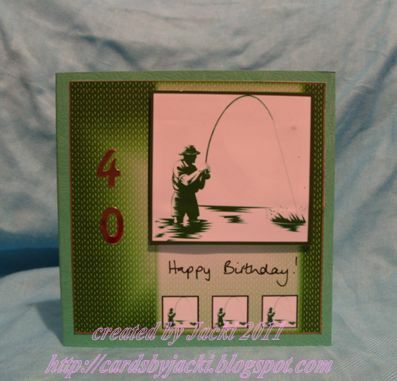 For Challenge 42 - Special Birthday - I made a concertina card. 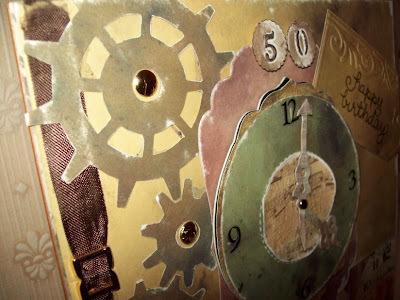 A friend and her husband are shortly going to Paris for a few days, during which time he will have a birthday, now that's what I call special. The card is all based on black folded card, measures 4"sq when folded up and 24" wide when open. I decided on giving it an old distressed look. The backgrounds are scrunched paper with ink over the creases. The image sheets are torn and creased, some with rolled edges. The stamps are all relevant to travelling and Paris, mainly from a Debbie Moore set of clear stamps. I have tried to keep it as masculine as possible but couldn't resist the bling for the Happy Birthday. I have left the back, plain black and told his wife, who has seen it, they could later add some small pics of their trip on the back. Good Afternoon everyone! Just a quick post to let you know that our regular Spotlight Challenges have now moved over to their very own blog HERE. There is a new challenge coming up in a few minutes so don't forget to go check it out and follow so we know you've found us lol! 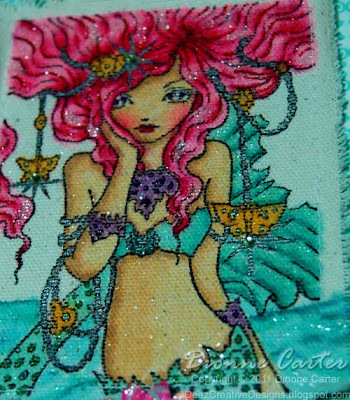 We're also joined by some new members of the team who will be joining in on Crafty Cardmakers and Crafty Cardmakers spotlight challenges over the next couple of weeks so please do give them a warm welcome and check out their blogs as we've chosen a very diverse mix of ladies so you'll get inspiration from a huge range of styles, skill and experiences. A warm welcome to you ladies and hope you settle into the team! Thank You for your pretty and inspired entries to our previous challenge of fairies and 2+ punches, we love fairies! We'll announce the winners and top 5 here on Tuesday 15th so good luck! Dont forget to check in the tab up there if you're a previous winner! Our DT call is coming to a close, details are over on the new home for the spotlight challenges which you'll find here I'll be contacting everyone who's successful this week, thank you for your interest and if you've not been lucky this time then don't give up, I'd love to take you all but simply can't. 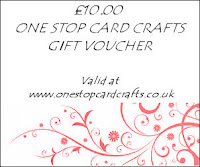 We are sponsored once again by One Stop Card Crafts who are offering a £10 voucher to their store! "At One Stop Card Crafts we have a big range of ever changing discount making and card making craft supplies. Our prices are very competitive and this & makes us an ideal place to buy your card making supplies online. Some of our new products include Petaloo flower layers, Ranger Glitter Glue and Martha Stewart Punches." You'll also find their challenge blog here! Everything on my card is fabric, apart from the corners, the sentiment, the gems, and the tiny brad in the centre of the flower. I started with a piece of plain white silk, which I dampened down and added Pebeo Silk Paints to (full instructions on my blog). I masked off the boot and the pattern around the edge and left in the window to dry. When it was fully dry I removed the masks and stuck the silk over piece of white card and pierced through the pattern and then embroidered it. I went around the edge of the silk with some toning ribbon, and stuck the whole thing down on a square card, and added the metal corners and flower. My sister calls me the Old Boot, so I thought this would be a fun card for her birthday! Hence the sentiment. I made a book to hold my stamped images so I could keep track of how many Sweet Pea Stamps I own, and what they look like since these are very detailed. I Stamped on Sticky Back Canvas and colored in with Copic markers. This was my first time coloring on fabric so I did a practice piece first to pick my colors, and to test how much the markers would feather out. This book is super sparkly because I added Distress Rock Candy and a water color iridescent medium. Well this card started life as a little saucy top lol !! I cut the fabric first and attached to card, then cut the lace off and attached around the edges. My fairy is one I downloaded ages ago, made the flowers and used sticky finger sprays to ink them, added some stickles around the edges. Coloured her with fired brick distress inks and embossed her. I have included fabric in 3 ways into my card. 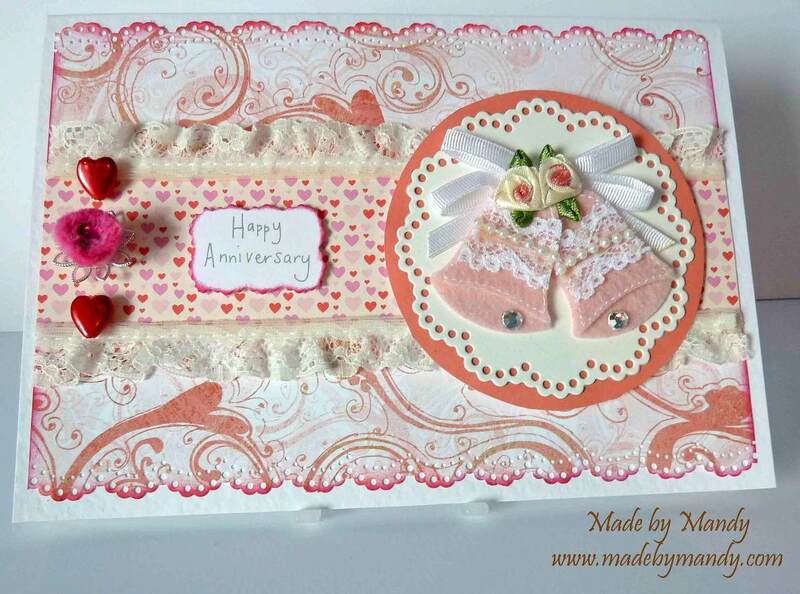 I have used a lovely Felt and lace embellishment that I have been hoarding for a long time as the main focal part of the card. 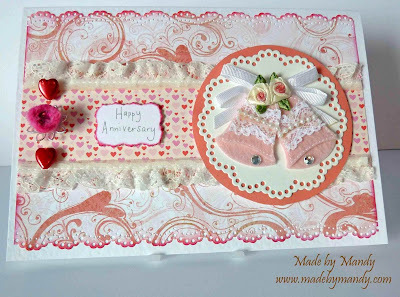 I have used a beautiful lace trim either side of the heart paper and I made a flower embellishment with a strip of fabric which I had frayed along the leading edge. Papers are from Basic Grey and Smirk. For the fabric element of my card I have used the blue backing which is a kind of half fabric and half paper that is made from recycled cloth.I have also used lace and ribbon.The image is a Popcorn The Bear stamp from Crafters Companion,sentiment is from Craftwork Cards and the little buttons are from Papermania. I had been thinking about making a cloth book for ages. Remember those ones you could buy for toddlers? Well, here's my version, lol. I used stamps from Rogue Redhead Designs that I was lucky enough to win as blog candy. I will put more details on my blog. 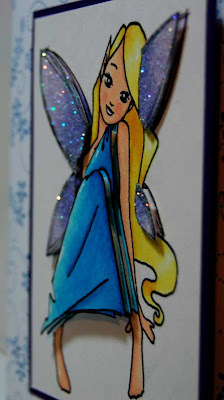 I thought this would be a hard wee challenge but after staring at my stash I decided to do a card with lots of ribbon! I started with a square piece of card covered in stickie tape then covered with ribbon from papermania. Added a matching piece of paper to a card and stuck down the ribbon square! 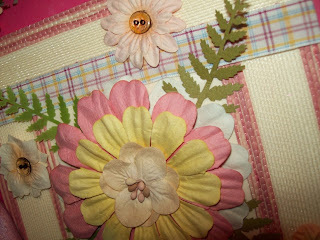 Made a wee rosette from the scraps of ribbon, embossed a wee silk flower and finished with a tiny button and sentiment! I used a fun Sweet Pea Stamp called my Sister and Me by Jeniffer Nilsson for this card. Seriously cute image! I stamped it onto sticky back canvas and coloured with promarkers and then stitched it onto a piece of canvas which I had triple embossed with moonglow and stamped onto with my texture stamp and some silver ink. The background is Adirondack inks sprayed onto photo paper. The ribbon is a roll I picked up cheap in Hobbycraft and the flower I made from some scraps of canvas coloured with promarkers to match the flower on the girl's headband and a nice gem for the centre. My plaid fabric ( I now see I should have done a Scottish theme) is from my Hubby Nic's shirt! He was chucking it, I liked the fabric, so I de-constructed it! I made a mat from plain greyboard (the back of a sketchpad!) and covered it with the fabric, I then mounted the image onto this and made a frame from the same grey board and mounted this over the image to frame it. The whole was mounted onto a pearlescent pewter card mat. The image is my own Eiglas 'Gretchen' lolling on a floor-cushion with her teddy watching the tv. I've coloured her with those markers again....what are they called..? Oh yes! Copics! LOL! I LOVE the background paper! It's called 'Ruby Berry Flower' and no other identifying names on the bar-code but I'm pretty sure it's Making Memories. Lickle nod to Sir Tim with the 'Imagine' ticket top left!